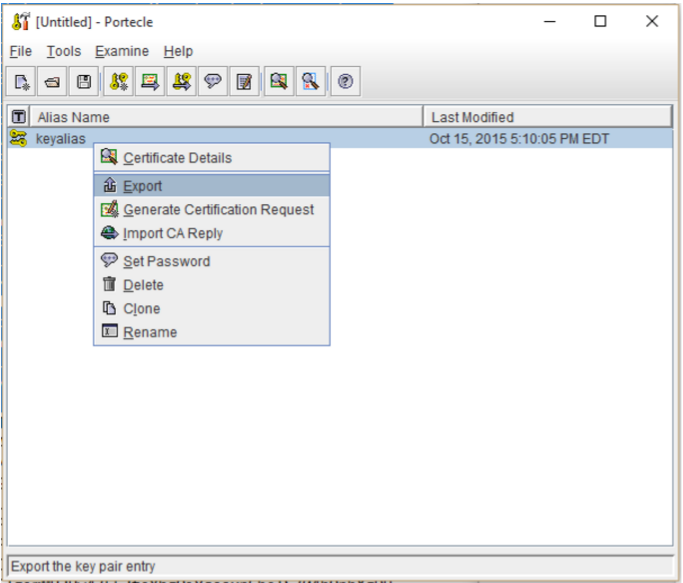 Portecle is a user friendly GUI application for creating, managing and examining keystores, keys, certificates, certificate requests, certificate revocation lists and more. The scenario for using such a tool is if a server system lacks the capability of generating a CSR keypair on its own. Another Senario would be if large networks of multiple server types, data centers and such are faced with a CSR keypair on one system environment and the tireless key store conversions that are required to import a keypair into a different server environment, which can be very time consuming and frustrating.  Portecle eliminates the need for a server to create a CSR keypair. 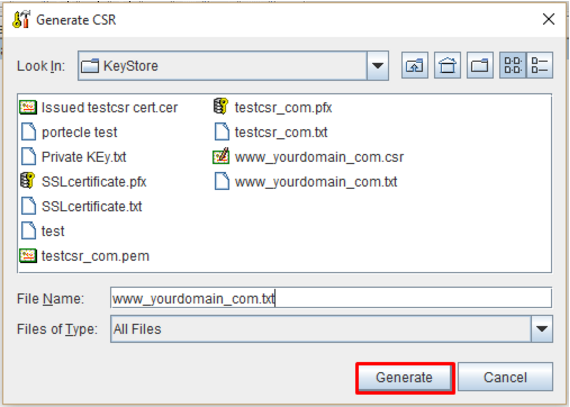 It acts as keypair CSR generator where you can generate a single key pair, create a CSR, import a Signing SSL certificate, convert and save different format types of this key pair, and migrate them into the various systems required. 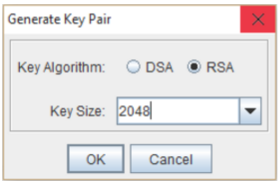 Generate DSA and RSA key pair entries with self-signed X.509 certificates. 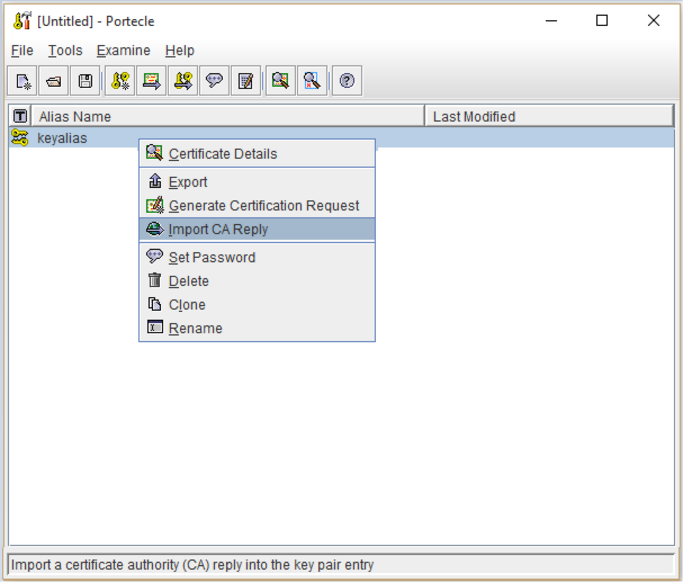 Importing an Intermediate CA or “Trusted Certificate” into your Keystore. Click Agree and Start Free Downloading. Open the JavaSetup.exe that you just downloaded to install. 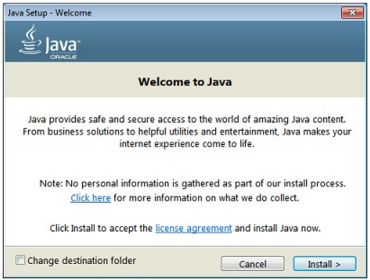 At the Java Setup installer click Install. The portecle.zip will be downloaded. 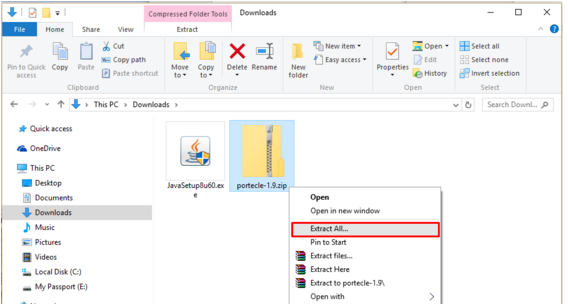 Right click on the compressed portecle.zip folder and select Extract All… to extract all files to a location of your choice. In the extracted portecle folder click on the portecle.jar to open the Portecle java executable jar file application. Note: When navigating portecle, in the lower left of the application you will typically find information pertaining to the keystore, or information pertaining to its functions when mousing over those functions. 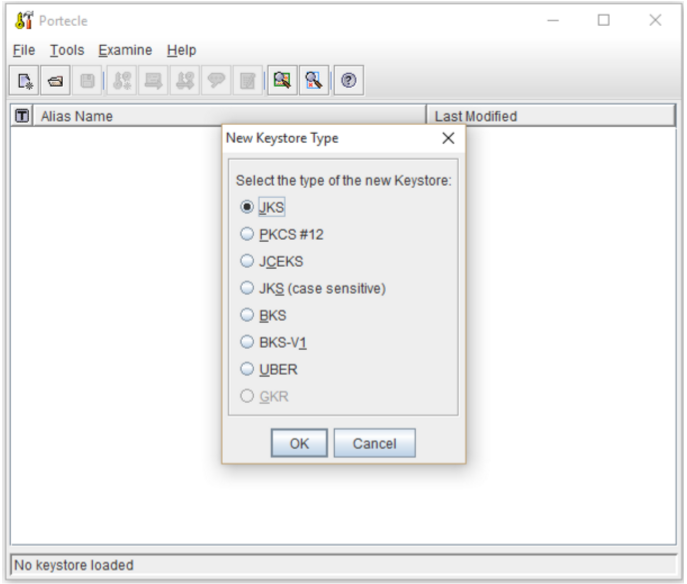 The New Keystore Type dialog is displayed. Select the desired keystore type to generate your keypair. JKS = Java Keystore used by Tomcat, Keytool, and Java codesigning. PKCS#12 = Used by Windows systems such as IIS/Exchange, and other Windows based applications. The title bar will change to display the text Untitled and the status bar will change to display the chosen keystore type. Saving your keystore will change the Untitled to whatever you name you choose specify for your keystore. The Set Keystore Password dialog is displayed. Specify a simple password to protect the keystore with, confirm it and press the OK button. Note: you will need to remember this password for SSL certificate installation and implementation. 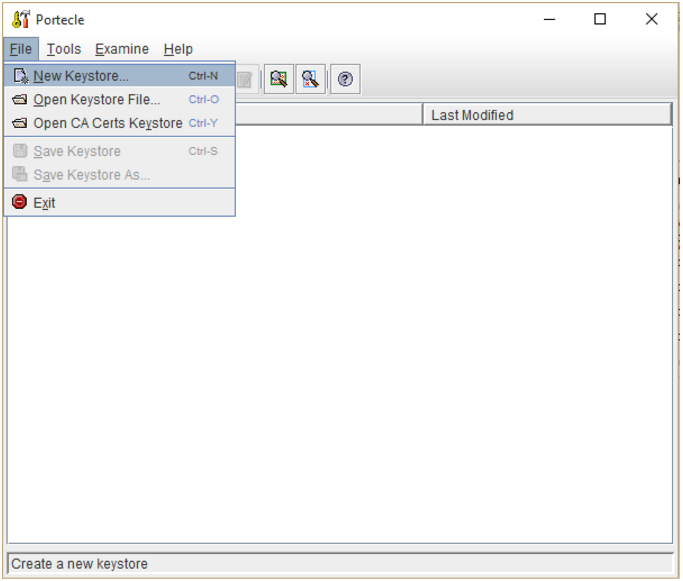 The Save Keystore As dialog is displayed. Select the folder where the keystore file is to be saved. Type the filename into the File Name text box. Note: For easily accessing your keystores add the extension to your file name based on your keystore type. Before you can get a SSL certificate you will have to generate a Certificate Signing Request (CSR), and before you can generate a CSR you will have to generate a keypair . The Generate Key Pair dialog will be displayed. Select a Key Algorithm and Key Size and press the OK button. Key pair generation will start in the background. Note: Standards dictate that your keypair/CSR Must be at least 2048. 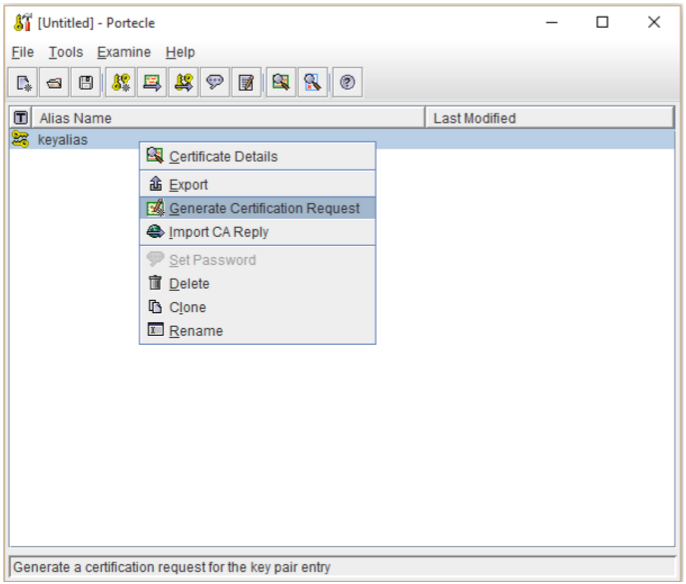 The Generate Certificate dialog will be displayed. Validity (days): Leave as Default. If you enroll for a CA SSL Certificate this will be overridden depending on your enrollment for a SSL certificate. 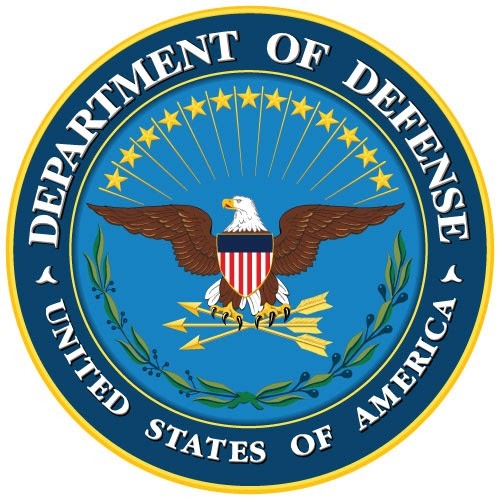 Organisational Unit (OU): A department name, such as ‘Information Technology’. Organisation Name (O): The full legal name of the organization. Locality Name (L): City where the Organization is located. do not abbreviate. State Name (ST): State, or Province where the organization is located. Do not abbreviate. Country Name (C): City, state, and country where the organization is located. Do not abbreviate. Contact Email (E): Your email. The Key Pair Entry Alias dialog pop up will appear. Specify an alias of you choice for the private key. Note: This alias will be used when you import your SSL certificate back into this keystore. 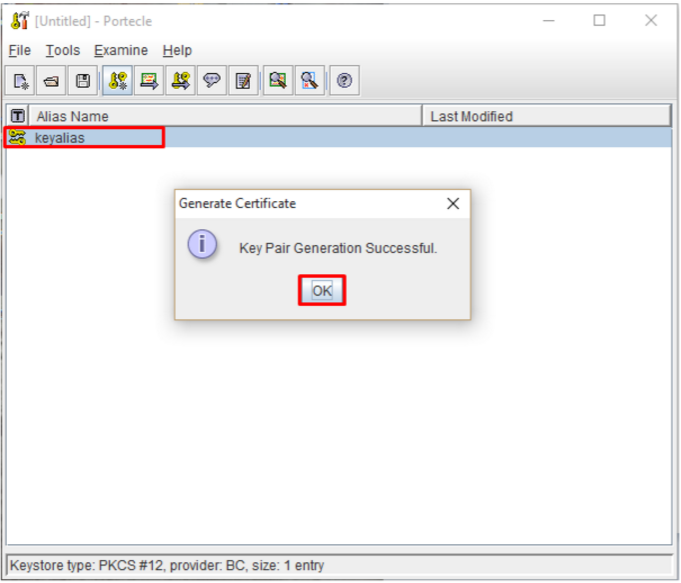 The Generate Certificate dialog dialog will display noting the “Key Pair Generation Successful.” you will also see your private key under the specified alias name now in your keystore. Congrats you have just generated a Private Key for your keystore. Now that your keystore and private key is now created you can now generate your CSR. Right click on your private key alias and select Generate Certification Request. Specify the location and path of where you will want to save this CSR file. Under File Name change the extension of the CSR request from .csr to .txt. This will save you some steps in submitting the CSR to the CA. Under Files of Type dropdown select All Files. A confirmation of a successful CSR generation will appear. You can now submit its entire contents when enrolling for your SSL Certificate from a Certificate Authority. Now that your SSL certificate has been issued from the Certificate authority you will need to import it into your keystore. Any SSL certificate format will be accepted but If you received a pkcs#7/.pdb file from your CA you will not need to worry about installing an Intermediate CA. This format type has the Intermediate CA included in its formating. Right click on your private key alias and select Import CA Reply. 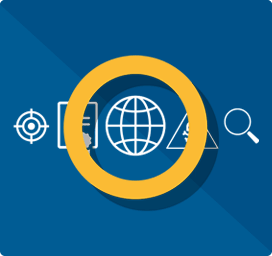 Specify the location and path of your saved SSL certificate file that you received from your CA and click Import. Note: If it cannot then the Certificate Details dialog will appear displaying the details of the reply’s Intermediate/root CA certificate for you to verify. After viewing the details acknowledge the dialog by pressing the OK button. A further dialog will appear asking if you wish accept the certificate. You have successfully installed and configured your keystore. It can now be moved and imported wherever it is needed. This error means that there is no trusted certificate to support the SSL certificate. This error usually appears when installing a x509/.cer/.pem/crt format certificate. In order to resolve this you must import your SSL certificates intermediate CA certificate first and then proceed to import the SSL certificate. 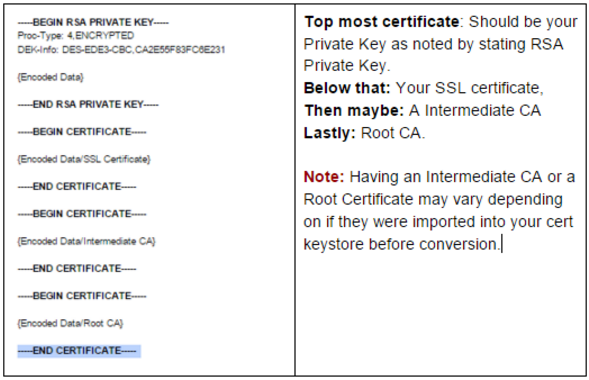 See Instructions for Importing Intermediate CA or “Trusted Certificate” into your keystore. If you chose Other as your server type and received a SSL certificate (Something other than a Windows format) and got a x509/.pem/.crt/.cer format certificate then you will need to import the Intermediate CA certificate for you SSL certificate first. or else you will receive the error “Cannot establish trust for the CA reply. The import cannot proceed.” as described above. in Importing SSL certificate. To resolve this perform the following. The Import Trusted Certificate dialog will appear. Select the folder where the certificate file is stored. Click on the required certificate file or type the filename into the File Name text box. A warning will appear shown below. This will happen. it’s just acknowledging to you that you need to manually confirm that this is a Trusted Intermediate CA. The details of the Intermediate CA will appear. Acknowledge that this is a trusted CA certificate by clicking OK. Under the Trusted Certificate Entry Alias specify an alias for the intermediate trust CA Any name will do. Your intermediate should be imported successfully, and a new intermediate certificate should appear within your keystore with the chosen alias. If you still need to install your SSL certificate go to Installing your SSL certificate section of this article. From the Tools menu, choose the Change Keystore Type. In the Change keystore Type sub-menu select one of the available format types you want to convert to. Note: you will not be able to convert a keystore into a format it is currently in. If you are converting your keystore from PKCS12 to JKS you may receive the pop you message below. This simply means that the password for the new converted keystore will be by default set to password. You can change this password later. To change the password to something else instead of “password” perform the steps in Setting new password for keystore. Note: This conversion will associate a password to the private key. Not all systems want a password associated with the private key. C-panel, WHM or other web hosted environments for example. Double check the hosted application you are attempting to import this converted private key (with password) into to see if it will accept private keys with password or not. Typically there will be an option that states something like “password“ when installing the private key on such systems. Recommendation 1: It might be easier to just generate a new CSR from the hosted system perform a reissue of the SSL certificate and perform a import directly into that hosted system instead. It will save you steps and frustrations finding out that the conversion does not work. Recommendation 2: Convert your keystore into a pkcs12 if it is not already and then use a web base converter or openssl. Some free web based pkcs12 > Pem/Apache converters found through Google search will give you a zip with all the certificates in their own respective files that you open in notepad and copy and paste into your application. Others will give you one file where you will have to open in notepad and copy and paste the individual certificates (Including the BEGIN and END headers) into their own files or into the application directly. You will see an example below in the Apache conversion. Right-click on the keystore entry in the keystore entries table. Select the Export item from the resultant pop-up menu. 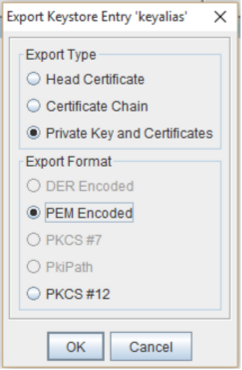 In the Export Keystore Entry pop up under Export Type select Private Key and Certificates. Specify the location and path of where you want to save this Apache file. To help you can see what these individual certificates are by using a online web based certificate decoder by performing a internet search. Note: Your private key you will not be able to decode because the password associated with it encrypts it. 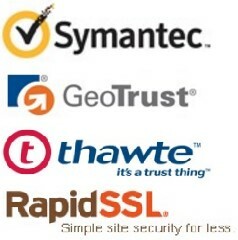 Your SSL certificate will have a common name of your domain such as www.example.com your intermediate will have a common name of something pertaining to the Certificate Authority that issued your SSL certificate. You will have to Copy and Paste these individual certificates into their own respective notepad files with either a .txt extension or whatever extension your server requires. Apaches typically want either .crt or .pem for its SSL certificate and intermediate files, and .key for the Private key file. . Consult your server documentation. When copying/pasting the individual certificates Included the header and footer and all data within. At the end of this journey you should have at least 2 certificates in their own respective files. Installation on Apache servers will only require three certificates typically. The Private key, SSL certificate, and IntermediateChain/IntermediateCA. Consult your server documentation. 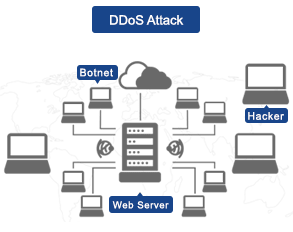 The time it took you to work through all this you could of probably just generated a new CSR from your Apache system and performed a reissue of your SSL certificate, giving you a new SSL certificate to be installed within that Apache environment. The Keystore Password box will display. Enter a password for this keystore and click OK. 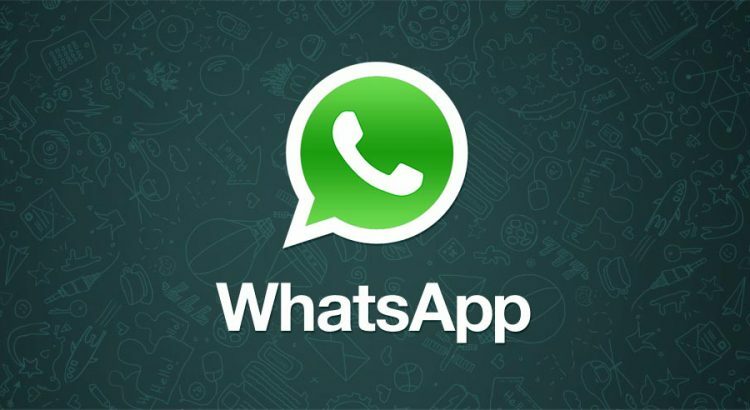 This Application also has many other features for you to experiment with. The ones listed in this document are the major ones that would pertain to its main functionality for creation of keystores, Privatekeys, CSR’s, Importing SSL certificate reply’s etc.. Remember to always save your keystore to finalise any configurations you want to take effect. Portecle is free software; you can redistribute it and/or modify it under the terms of the GNU General Public License as published by the Free Software Foundation; either version 2 of the License, or (at your option) any later version. Portecle is distributed in the hope that it will be useful, but WITHOUT ANY WARRANTY; without even the implied warranty of MERCHANTABILITY or FITNESS FOR A PARTICULAR PURPOSE. See the GNU_General Public License for more details. 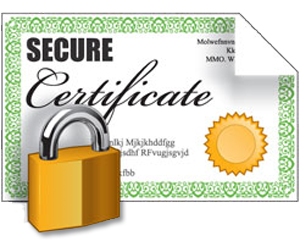 A Certificate Signing Request or CSR is a specially formatted underdeveloped public key that is used for enrollment of an SSL Certificate. 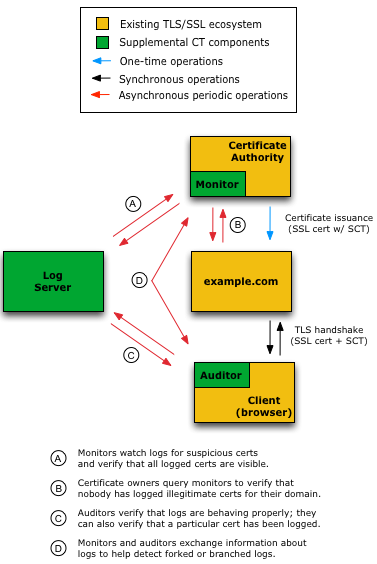 The information on this CSR is important for a Certificate Authority (CA). 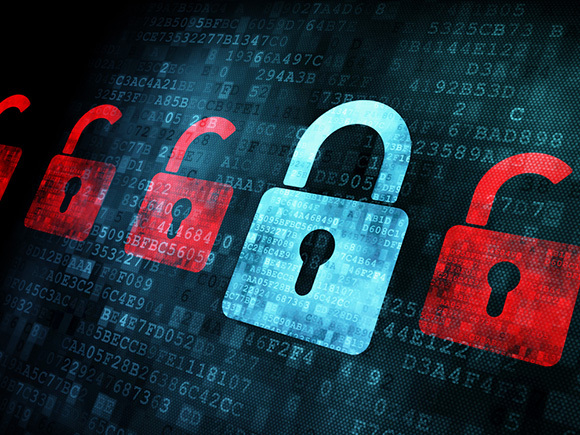 It is needed to validate the information required to issue a SSL Certificate. Creation of a CSR also means you are creating your private key. The private key will always be left on the system or application where the CSR is generated. 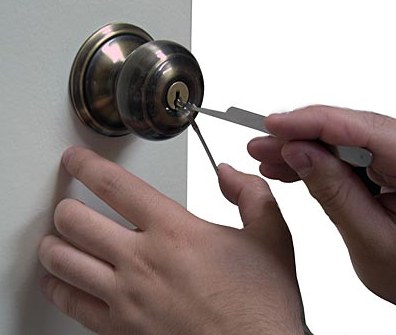 The Private key will be required later for installation. If you do not see your server listed Perform a search or you may have to contact your server vender or hosting provider for best practices on how to generate a CSR on your system. Note: You might be prompted on some server systems or applications to associate a password for your CSR. Leave this blank or bypass it by pressing Enter depending on the system. 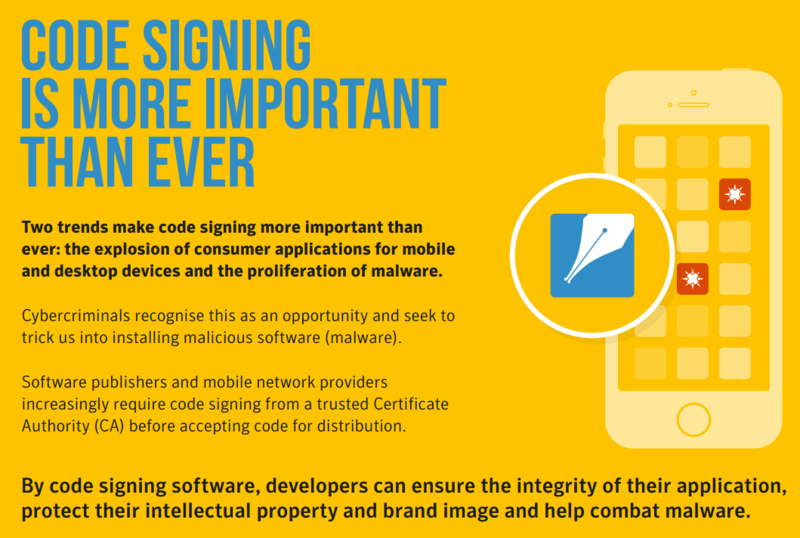 Associating a password with your CSR will encrypt it and will cause issues with enrollment. If this happens you will have to regenerate another CSR without a password. 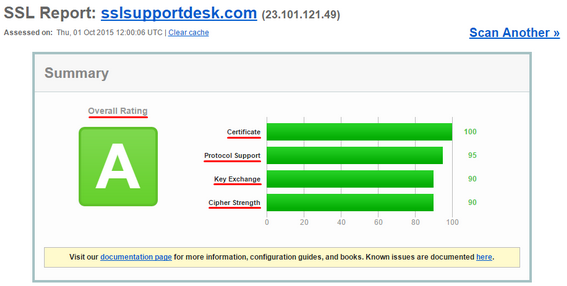 To check the information of your CSR visit the SSL Tools CSR Checker.